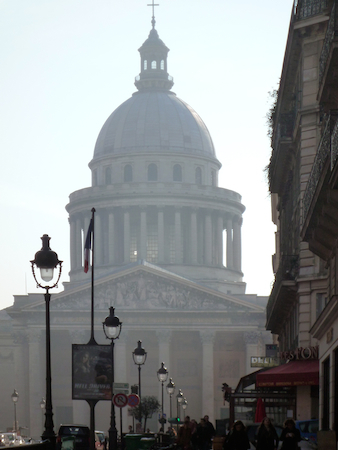 As you leave the Luxembourg Gardens and head east along the Rue Soufflot in Paris’s dense Latin Quarter, the imposing portico and dome of the Panthéon draws you forward. It is an irresistible sight. 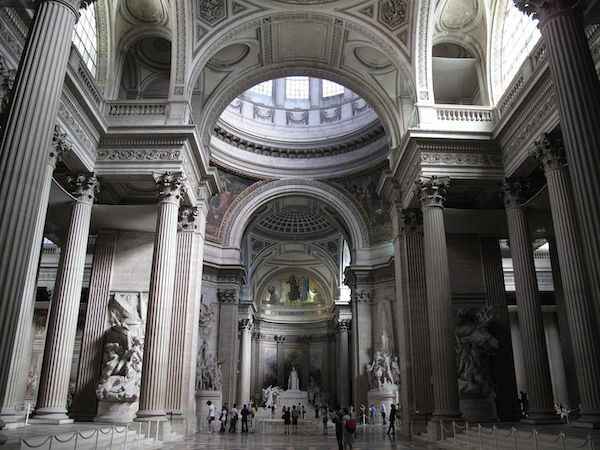 One of the most impressive buildings of the Neoclassical period, the Panthéon, originally built as the Church of Ste-Geneviève, was conceived as a monument to Paris and the French nation as much as it was the church of Paris’s patron saint. Jacques-Germain Soufflot, its architect, was highly praised for the design—although a few of his contemporaries thought he went too far in defying tradition and structural necessity. Soufflot was heralded during his life as the restorer of greatness in French architecture and the building was lauded, even before it was completed, as one of the finest in the country. Encountering it today as its lofty dome rises far above surrounding buildings—including two of its most important neighbors: the small but influential Bibliothèque Sainte-Geneviève (1838-50) by Henri Labrouste, and the enchanting late-medieval and Renaissance church of St-Étienne-du-Mont (both, above)—it remains as awe-inspiring as it must have been in the late eighteenth century, despite some important changes since its opening. 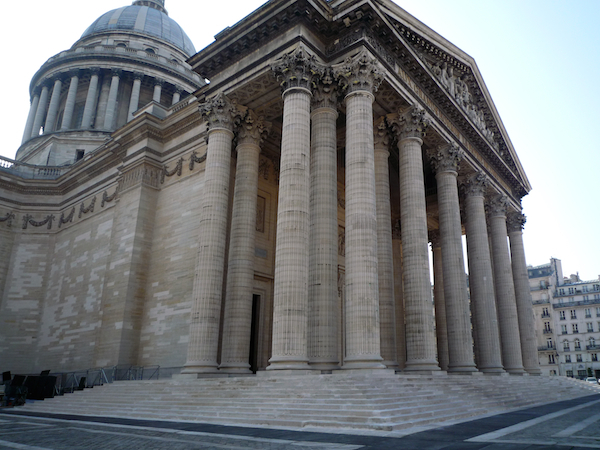 A century and a half of French political history can be tracked with unusual precision in the original design and subsequent changes in the Panthéon’s function and title. Soufflot’s Ste-Geneviève was built to replace a decrepit medieval abbey, an idea first proposed during the time of King Louis XIV. The project fit, however, with Louis XV’s program to aggressively promote his role as avatar of the nation’s greatness. The king saw the church’s rebuilding as a token of his munificence and as material confirmation of the French Catholic Church’s quasi-independence from the pope. And more specifically, the church was the fulfillment of Louis XV’s pious vow, made in 1744 to his mistress, Madame de Pompadour, to rebuild the church if he recovered from a fever and illness so severe that he had been administered the Last Rites (a Catholic ritual of prayer for those considered close to death). Soufflot’s Ste-Geneviève, then, was meant to focus the nation’s piety on an unmistakable symbol of national and royal significance. The church’s dedication to Saint Genevieve was important to its original political significance. She had become one of France’s most important historical religious figures well before the eighteenth century. According to legend, she had been instrumental in repelling Attila’s Huns before they reached Paris in 451, and her relics were said to have miraculously helped Odo, the ruler of Paris, resist a Viking attack in 885. A monastery was eventually formed around the site of her burial in a church built originally in the early sixth century by Clovis, the first king of the French territory, although it underwent many changes through the twelfth century. The site, then, was the spot of an ancient and venerable shrine—and vitally important to the identity of Paris through many centuries. Thanks to the Marquis de Marigny, the Director of Royal Buildings, Louis XV appointed Soufflot architect of the new church in 1755. By that time, Soufflot had achieved high standing in the French architectural profession, having recently completed a number of important buildings in Lyon, France, as the city’s municipal architect. Soufflot had earlier established close ties to the French court when he accompanied Marigny as an architectural tutor on a journey through Italy. Marigny and the king calculated that Soufflot was the best candidate to give them the kind of memorable and forward-looking building that they wanted for their interconnected political and religious purposes. Soufflot’s pupil Maximilien Brébion stated that the church’s design was meant “to unite … the purity and magnificence of Greek architecture with the lightness and daring of Gothic construction.” He was referring to the way in which its classical forms, such as the tall Corinthian columns and the dome, were joined with a Gothic type of structure that included the use of concealed flying buttresses and relatively light stone vaulting. Inside, the unusually abundant rows of free-standing columns support a series of Roman vaults and the central dome in a remarkably clear and logical expression of space and structure—one of the artistic goals of Soufflot and certain other French architects of his generation. 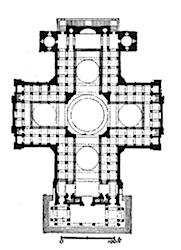 Ste-Geneviève is a Greek cross in plan (nave, north and south transepts, and choir are of equal dimensions), and originally the walls were pierced with windows in each bay between the columns. This structure created a Gothic sense of openness out of the classical columns and round-arched (as opposed to Gothic pointed-arch) vaults. Together these elements endowed Soufflot’s building with stark order and light-filled spaciousness. The relative lack of decorative adornment contributed greatly to the sense of spatial clarity and austere grandeur. Inspired by both recent archaeological excavations of ancient architecture and a new-found concern for the medieval heritage of France—primarily the great Gothic cathedrals—Soufflot and other architects, including the influential theorist Julien-David Leroy, sought to update French architecture by incorporating lessons from the most impressive and authoritative models of the past. In particular, Soufflot modeled aspects of Ste-Geneviève on three earlier, highly-esteemed churches: St. Peter’s Basilica in Rome (especially its dome by Michelangelo); St. Paul’s Cathedral in London; and, in Paris, the church of the Invalides Hospital. Architectural historians have interpreted this approach to historical models as stemming from the Enlightenment’s view of history, which saw the past as an unfolding, linear progression of events that could be studied in a rigorous, almost scientific way to extract lessons or models useful to the present generation. Older buildings were not to be copied directly—Ste-Geneviève is no mere facsimile—but were to be measured, drawn, and closely examined for the lessons they might hold for solving modern problems. Ste-Geneviève updated architectural traditions in more specific ways, too. 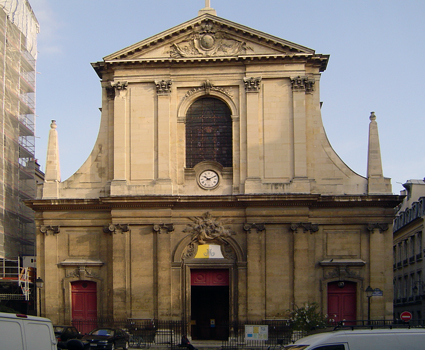 Other recent churches in Paris, such as Notre-Dame-des-Victoires and Saint-Roch, had used a Baroque formula borrowed from well-known seventeenth-century churches in Rome. These churches had tripartite fronts that rose up in the center, all usually articulated with profuse sculptural decoration. Their facades played sophisticated formal design games with engaged columns and flat pilasters, creating varied and dynamic surfaces that Neoclassical architects regarded as bizarre and licentious. With the neoclassical focus on the supposedly purer or more “natural” architectural forms of antiquity—a view exemplified, for instance, in Marc-Antoine Laugier’s radically reductive Essai sur l’architecture (1753)—free-standing and orderly rows of columns, centralized plans, and restrained ornament were favored over the Baroque models. Soufflot’s rejection of these models put him at the forefront of Neoclassicism and also symbolically supported the king’s antagonism toward the Roman Catholic Church. 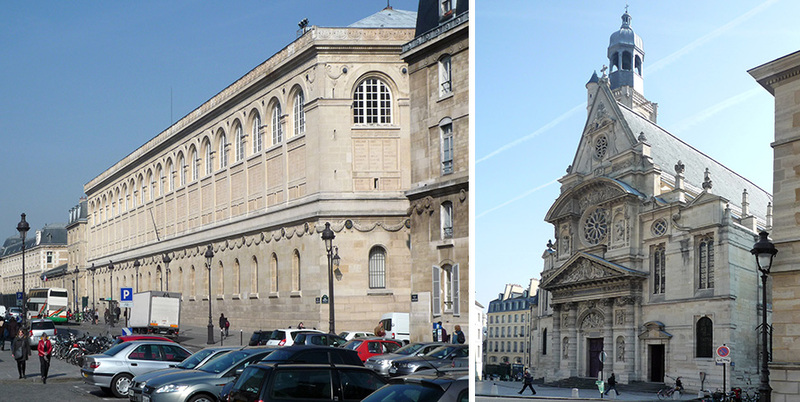 Ste-Geneviève thus marked a new direction for both religious and state buildings in France. Shortly after Ste-Geneviève’s completion, the tumultuous politics of the French Revolution in 1789 and its repercussions throughout the nineteenth century led to alterations in the building’s form and meaning. In 1791, at the height of the Revolution, the country’s National Constituent Assembly decreed that Soufflot’s church be converted to a secular Temple to Great Men. The original inscription on the portico’s frieze (a dedication to the patron saint by Louis XV), was replaced with the one still visible today (above): “To the Great Men [from] a Grateful Fatherland” (Aux grands hommes la patrie reconnaissante). 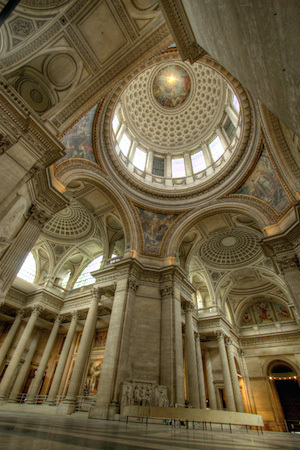 The church became a pantheon—Le Panthéon— honoring illustrious modern French citizens, starting with the widely influential Enlightenment philosophers Rousseau and Voltaire. The architect and theorist Antoine-Chrysostome Quatremère de Quincy was charged with transforming the luminous church into a solemn mausoleum for the celebrated dead; instead of a reliquary for the remains of Saint Genevieve, it was to be a receptacle for “the ashes of the Great Men,” according to the Assembly’s decree. In fact, in 1793 the Revolutionary government put the saint’s relics on trial—she stood accused of having spread religious error—and symbolically exorcised her from the building. Quatremère de Quincy removed all the symbols of the building’s church identity, including the bell towers at the east end. Most dramatically, he bricked up the lower windows, turning the exterior walls into expansive stone slabs and rendering the interior darker. This had the side-effect of providing extensive interior wall surfaces for eye-level decoration, which eventually included the famous late-nineteenth-century murals by Pierre Puvis de Chavannes illustrating the life of Saint Genevieve (above). The other major post-Soufflot change to the building fabric was the strengthening of the crossing piers that support the dome, carried out in 1806 by Soufflot’s former collaborator, Jean-Baptiste Rondelet. The building’s dedication swung back and forth between church and secular temple throughout the nineteenth century. 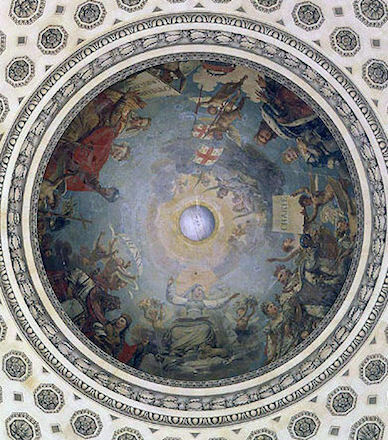 After Quatremère de Quincy’s Revolutionary transformation of 1791, it was reconsecrated as a church under Napoleon in 1806, the occasion for the addition of Antoine-Jean Gros’ painting of The Apotheosis of Saint Genevieve on the dome. 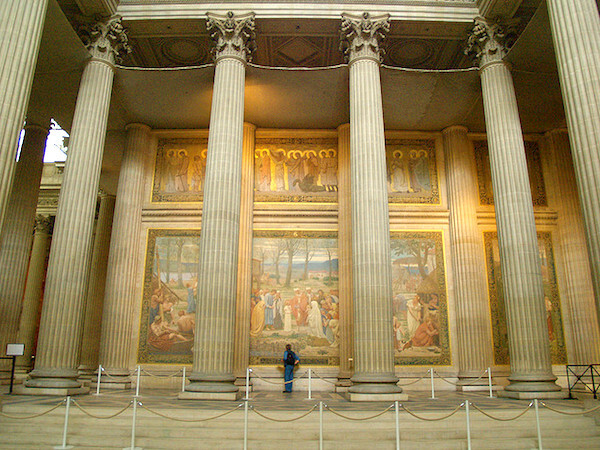 It was then changed back to the secular Panthéon following the July Revolution of 1830; turned into a remarkably idealistic Temple to Humanity after the revolution of 1848; remade once more as Saint Genevieve’s church in 1851 under Louis Napoleon; and, finally, conclusively secularized yet again in 1885. These successive changes were marked especially by the building’s decoration, above all the sculpture in its pediment, which was recarved four times. The final and still visible pediment sculptures are the allegorical representations of the Fatherland, History, and Liberty by Pierre-Jean David d’Angers, completed in the 1830s during the July Monarchy. As revolutions, kings, and emperors came and went over the course of the nineteenth century, the Panthéon was there as a silent but attentive witness. The ultimate transformation of the church into a secular temple of Enlightenment was confirmed in spirit, if not by final writ, when, in 1851, the scientist Léon Foucault hooked a cable to the center of the dome, creating a huge pendulum that he used to experimentally demonstrate the earth’s axial rotation. Since 1995, a replica of “Foucault’s Pendulum” has been in place under the Panthéon’s dome, an unusual but appropriate coda to the history of a building which from the start had broad significance extending beyond its place and time. Avner Ben-Amos, “Monuments and Memory in French Nationalism,” History and Memory vol. 5, no. 2 (Fall-Winter 1993), pp. 50-81. Barry Bergdoll, ed., Le Panthéon: Symbole des révolutions: De l’Église de la Nation au Temple des grands hommes (Paris: Picard, 1989). Allan Braham, The Architecture of the French Enlightenment (Berkeley and Los Angeles: University of California Press, 1989). Cite this page as: Dr. Paul A. Ranogajec, "Soufflot, The Panthéon (Church of Ste-Geneviève), Paris," in Smarthistory, January 8, 2016, accessed April 19, 2019, https://smarthistory.org/soufflot-the-pantheon-church-of-ste-genevieve-paris/.